Door Monitoring Devices | Nursing Home Security | Wireless NurseCall Systems, Inc.
Our DMIT (Door Monitoring with Integrated Transmitting) and DMIP (Door Monitoring with Integrated Paging) devices allow for complete control of all pertinent doors within your facility. The DMIT is a stand-alone device that, when activated, will send an alarm signal to our dedicated receiver network which will notify caregivers of an alarm situation at that particular door. The DMIP is also a stand-alone device that has an integrated paging transmitter. This allows the device to operate in a facility that does not require a receiver network. Once activated the DMIP will send out a paging signal that will alert the caregivers of an alarm at the specific door. Both of these devices are usually coupled with a delayed egress magnetic lock that will automatically engage when an alarm condition is met. The caregivers will then have to physically proceed to the door and input a keypad code in order to reset the alarm condition. The Wireless NurseCall Systems Access Control System (WNACS) provides complete control and fail-safe features that surpass most other systems available today. Automatic disengagement of Magnetic Locks when signaled by the building fire / sprinkler protective signaling system. Disengagement of Magnetic Locks by local Motion Detectors – where required by local fire codes (adjustable time period, set at installation for prescribed seconds). Disengagement of Magnetic Locks by a Push-to-Exit pushbutton (adjustable time period, set at installation for prescribed seconds). 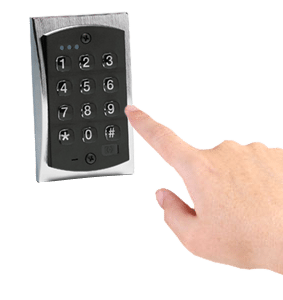 Disengagement of Magnetic Locks by an Internal or External keypad (adjustable time period, set at installation for prescribed seconds). Disengagement of all magnetic Locks by a switch on the power supply unit. Hard wired interlocks of Push-to-Exit pushbutton and Keypads to disengage Magnetic Locks in event of Door Controller PCB malfunction, Door Controller PCB loss of power, or loss of central computer communications. All of the above local, at door location, disengagement features hard-wire override the lock commands from the central control computer. Timed door access / lock – such as unlocked during normal business hours and locked during nighttime hours. Access can be controlled independently for each door location. To begin designing your customized solution, please contact the Wireless NurseCall Systems team today at 480-940-9111 or submitting an inquiry via our web form. Wireless NurseCall Systems, Inc. manufactures and installs a variety of custom access control solutions and door monitoring devices for nursing home security throughout the United States and Canada.